The meaning of colors was important to Native American Indians as each color held a special sacred symbolism. The meaning of colors changed according to the purpose they were put to. 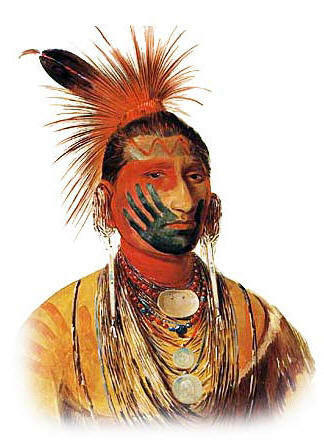 The meaning of colors used for face paint held a different symbolism than those colors used for War Paint. The Northwest tribes constructed totem poles that have unique features and colors depending upon the clan or tribe. The meaning of colors, ornamentation, and painted decorations used to adorn sacred Prayer sticks and Talking Sticks also had special meanings and were chosen for the attributes of the colors and how these might influence the outcome of an important event. The Circle of Life, as depicted in the Medicine Wheel also contained different color meanings and symbolism. The Navajo sand paintings have a specific meaning and each color used represents a physical direction. This article provides details of the meaning of colors according to their purpose and the beliefs of the tribes. Every picture of a Native American Indian has a mysterious and secret meaning. The paint and symbols of a Native Indian had meaning and so did his choice of colors. What was the significance and meaning of colors used by Native Americans? There were so many tribes of Native American Indians it is only possible to generalise the most common Meaning of Colors of the paint they used. The following Meaning of colors list provides generalized details of each paint color, its significance and its symbolism. The meaning of colors, ornamentation, and painted decorations used to adorn sacred Prayer sticks and Talking Sticks also had special meanings and were chosen for the attributes of the colors and how these might influence the outcome of an important event.